Microsoft has released this behind-the-scenes video of Halo: Combat Evolved Anniversary and some screens showing off High Noon, the remake of the multiplayer map Hang ‘Em High. Below, you will also find details about Kinect functionality. High Noon returns players to the familiar canyons and catwalks of Hang ‘Em High, now re-imagined for “Halo: Anniversary” with unprecedented detail. The vast generator complexes, which power this enormous slip-space portal, allow it to connect with an unknown number of locations across the galaxy. High Noon is a densely-packed arena of platforms, corridors and cover, best suited for team-based combat in both Slayer and Objective gametypes (4 - 12 players). * The Library – The Library is an expansive index that provides detailed information on items of interest players have scanned through “Analyze Mode,” such as vehicles, characters, enemies and weapons. Through the use of gesture controls, players can explore the entire Library at any time and then return to the campaign to continue unlocking more secrets within the “Halo” universe. * Voice Commands – Harness the technology of Kinect for Xbox 360 to reload your weapon, throw grenades, switch seamlessly between Classic and Re-mastered graphics and more, using only your voice. * New Halo Waypoint Interface – A revamped design and user interface lets players navigate Halo Waypoint and access the content they want more easily than ever before, whether they’re online, on their Xbox 360 or on their Windows Phone. * Halo Waypoint ATLAS – Available on Windows Phones this Christmas, Halo Waypoint ATLAS (Advanced Tactical Assault System) is a new mobile experience that offers players a detailed, top-down view of any “Halo: Anniversary” or “Halo: Reach” map in real-time, letting them monitor teammates’ movements and positions as they play. This innovative app encourages strategic gameplay and offers a fun companion experience to any multiplayer match. * Custom Challenges – Building upon the “Halo” series’ genre-defining user-creation toolset, 343 Industries is empowering the community even further by introducing Custom Challenges in “Halo: Anniversary” and “Halo: Reach.” For the first time, players will be able to issue custom Challenges and create friendly competitions with Xbox friends, unlocking infinite creative possibilities to invent and test their “Halo” skills against one another. Brilliant stuff, a remake work buying! i'll be renting it. could be decent going through co-op again, assuming it hasnt aged horribly? No doubt, other remakes pal in comparison!, day one. Ever heard about a first Resident Evil remake? Waiting for this game is driving me crazy like no other game has! Funny considering I've already played through the game many times over the past ten years. Yet I want this more than any other new games this year. Yes, and my statement still stands. yeah, while things havnt changed massively between each game, going from reach to CE could be a bit...odd. hopefully the gameplay holds up. things have changed quite a bit since it first came out. It speaks to the massive quality of the original that it's still played so often, and on top of that, we are SOO willing to buy it again. Ultra Classic!! Great job these folks have done,this should be the standard for all remakes.I understand remastered HD versions too, but i prefer these kind of remakes the most. Cant wait to get this game. You must mean other "HD ports". But ok I will just use your term remake. so Yeah its true other "remake" pale in comparison as to the ammount of money being dumped into them and expected to be made. 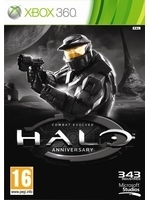 Halo series game since Xbox 1 have sold over 4 million copies each and thats before the Xbox 360 where Halo 3 sold over 8 million copies in the same year it launched and each game has not dipped below 4 million sold in the year except for Halo Wars and thats not a fair comparison because that was an RTS, yet if you check its sales and compare to other RTSs even on PC I am willing to bet that no other RTS has sold more than Halo Wars, rip Ensemble Studios. Agree such a brilliant HD Remake, cant wait to play it with its shiny new coat and MP. Awesome remake, this is how you do it - keep the flavor, update the graphics, and add new features that don't get in the way of the old game. Really hope the Noble 6 models are just place holders...bad enough it's Reach's MP coding. its reachs multiplayer with tweaks for this edition, the models are not place holders there armor kits to make your own spartan, like all of them since halo 3..